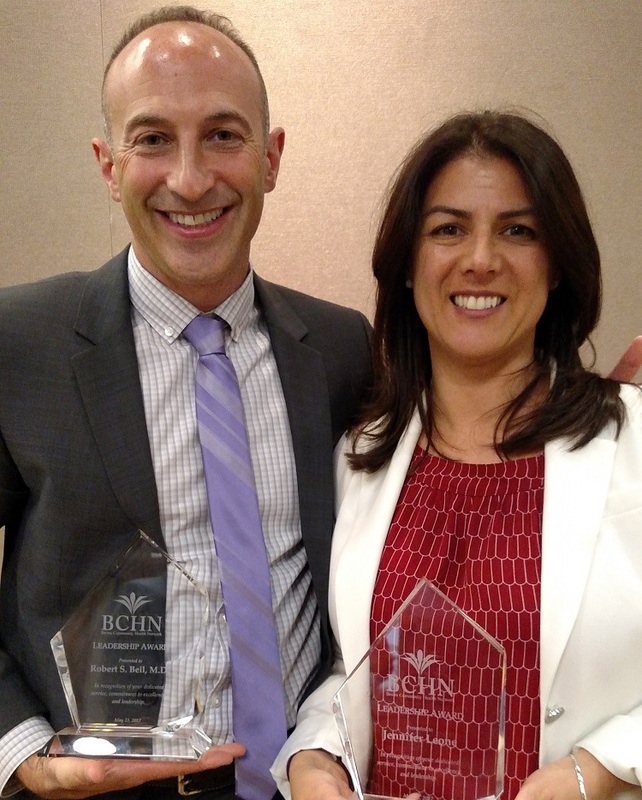 During the 2017 Bronx Community Health Network Symposium & Annual Meeting on May 23, BCHN chief medical officer Dr. Jay Izes presented Leadership Awards to Montefiore Medical Group's Dr. Robert S. Beil and Jennifer Leone. The awards are given in recognition of the recipients dedicated service, commitment to excellence and leadership. Dr. Robert S. Beil came to the Bronx after finishing his undergraduate work at Washington University in St. Louis and medical school at the University of Cincinnati. His residency started during some of the darkest days of the American HIV epidemic, when the average lifespan of patients from HIV diagnosis was 2 years and a multi-drug resistance tuberculosis epidemic was sweeping the Bronx. He witnessed firsthand in 1995 as revolutionary HIV medications became available and many of his patients went from having no hope of survival to having the power to survive and thrive. This inspired him to pursue a career in HIV medicine.